A traditional Savoyard town, that is both picturesque and unspoilt, Megève is one of France’s most upmarket ski resorts in the Alps. Traditionally very popular with the French the resort’s charm is now being discovered by more and more oversea guests. Narrow cobbled streets and exclusive boutiques make up this pretty medieval village, this combined with a distinct lack of large hotels makes Megève a great option for those looking for something different. Megève has plenty to offer both on and off piste skiers. The 445km of piste skiing, made up of beautiful tree lined runs and stunning scenery, is ideal for intermediate skiers. For beginners there are several blue and green runs to choose from as well as acclaimed international ski schools. If skiing is not your preferred activity then there are several other options. There is plenty of cross country skiing on offer too with 27 miles of Alpine trails. An array of activities will keep non-skiers entertained, from hot air balloon rides to Megève’s sports centre with indoor swimming pool, wellness area and two ice rinks. Conveniently located just over an hour from Geneva airport makes Megève a popular choice for weekend breaks and family ski holidays. Kaluma can help with all of your travel arrangements as well as booking the perfect hotel or catered ski chalet in Megève. With a ski area divided into three main sectors – Rochebrune, Mont d’Arbois and Le Jaillet, there is plenty to offer all levels of skier in Megève. 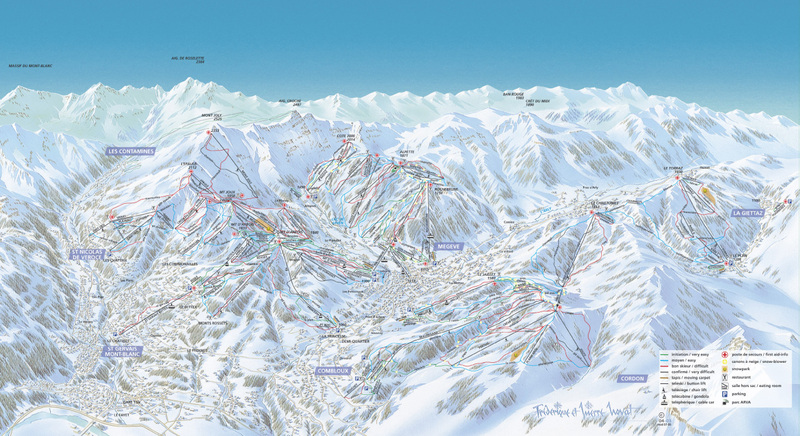 The Domaine Evasion Montblanc liftpass covers Megève and neighbouring Saint-Gervais-les-Bains, Combloux, La Giettaz, Saint Nicolas de Véroce and Les Contamines-Montjoie. This expansive 445km ski area consists of 136 groomed piste runs, so you are surely not to get bored. For beginners there is an excellent area with plenty of wide green runs at Mont d’Arbois, this is easily accessible by both cable car and ski bus. For more advanced and off piste skiers the best area is the Mont Joly and the Mont Joux where the slopes are particularly steep back down to the resort. Off piste skiers looking to work on their technique should head over to the area of Christomet for one of the most challenging areas. For a relaxing afternoon head into the centre of town to wander around the historic buildings and luxury boutiques followed by a sleigh-ride home in one of the many horse drawn carriages. A hot air balloon ride over Mont Blanc is an experience not to be forgotten with stunning views of the surrounding snow capped mountains. Some of the best food on offer in Megève can be found up the mountains so be sure to indulge on at least one day. Megève is home to some of the best mountain restaurants in France (there are 34 to choose from! ), where you can enjoy Savoyard specialities in rustic settings or relax in cosy alpine lodges. In Megève itself the quality of the food is second to none, from Michelin starred to Gault Millau there are plenty of options for those looking to enjoy some gourmet fare. The exclusive Le Ferme de Mon Pere has three Michelin stars and is sure to deliver something special. For those more low key moments there is an array of restaurants on offer from traditional Savoyard to Italian options. Whilst Megève is not renowned for it’s après ski there is a selection of bars open from 4pm until the early hours for those looking for some nightlife.